Nebula Cat's Eye - Universe Galaxies And Stars Section. 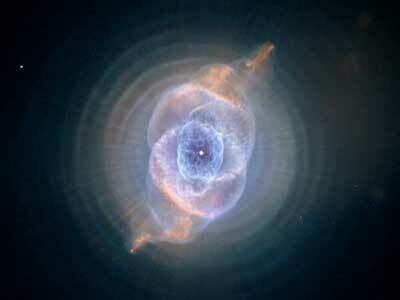 NASA's Hubble Space Telescope shows Cat's Eye Nebula. As if the Cat's Eye itself isn't spectacular enough, this new image taken with Hubble's Advanced Camera for Surveys (ACS) reveals the full beauty of a bull's eye pattern of eleven or even more concentric rings, or shells, around the Cat's Eye. Each 'ring' is actually the edge of a spherical bubble seen projected onto the sky - that's why it appears bright along its outer edge.